I recently blogged about managing changes to your project this post discussed the definition of change, sources of change, early warning signs, the change control process, and measuring change. In this post I am going to focus in on the change control process. The overall goal of change control is to prevent changes from overwhelming a project or taking the project unnecessarily off track. The goal of change control is NOT to prevent all change. The change control process enables proactive identification and management of change, in a manner that keeps the project moving in the right direction, towards successful completion/delivery. Effective change control processes maintains the appropriate balance between control/discipline to manage to the baseline plan, and flexibility to adapt the plans to meet customer expectations. In the spirit of not overcomplicating the process, the basic steps associated with the change control process are pretty straightforward (depicted in the graphic below). Changes may be identified while updating and evaluating schedule progress, performing project budget updates and analysis, assessing on-going project risks, performing quality control activities, and engaging with project stakeholders (e.g., project team, project sponsors) via normal project communication channels. While comparing the work results to the plan (part of monitoring and controlling project work), you realize that testing activities are taking twice as much work effort to complete based on original estimates. A risk is identified that a key resource will be taking a leave of absence during a critical month of the project. You are updating the project budget and identify that consultant rates are consistently tracking 10-12% higher than originally planned. You are managing a project for the introduction of a new product. The company finds out that a competitor is developing a similar new product, and something will need to be done in order to be competitive. This is brought up at a project sponsor update meeting, and requires follow-up actions. During load testing, the team realizes that the technology architecture is unable to handle the necessary volume. This started as a project risk, and is now a project issue. The change represents something that is new or different than what was utilized to establish the baseline plan. Clarifications or more detailed definition of planning components (progressive elaboration) generally are not handled as project changes. This is a point that is often contentious from a customer relationship perspective. The change control log is the place that any project team member can go to see all of the changes that have been identified and the current status of all of those changes. Once a change is identified, it needs to be assessed for impacts. The following dimensions of the project could be impacted: scope, schedule, cost, risk and quality. Is the current baseline scope going to be impacted and how? Is the current baseline schedule going to be impacted? Is the current baseline budget going to be impacted? Is the agreed upon quality of deliverables and/ or product going to be impacted? Is the change going to impact the assessment of project risk? The impacts could be positive or negative. As the project manager, you are managing expectations. Establishing a baseline helps manage expectations among stakeholders and commitments to the customer/ end users. If that baseline will be impacted by a change, that needs to be examined. It is important to quantify the impacts of a change. If the impacts are not clear, it is difficult to make an appropriate decision about whether or not to approve and implement a change to the project. When possible, impacts should be quantified by indicating cost impacts in dollars, schedule impacts in work-days, resource impacts in hours effort, risk impact in terms of the risk assessment (before and after implementation of the change), and quality in terms of impact on open defects / issues. For example, there is a change request to add functionality to a system, and development has already been started. The assessment should identify what activities are required to add that functionality, including the additional hours of work and cost of that labor, and the resulting schedule impacts of doing that work. When considering what activities are required to add the functionality, you have to consider the fact that the system requirements, system design, and test plan will all most likely need to be revised. Also consider any re-work that may have to be done for parts of the system that have already been developed. It may also be possible to quantify the increase in user satisfaction by adding the functionality to the system. The Project Management Plan establishes the change review and approval process (you do not want to be in a position where the process is “invented” in response to the first change). In addition, a process must be established to accommodate review/approval of “rush” changes. These are the changes that have a time constraint for associated with making a decision about the change and/or have an extremely high impact on the project. At a minimum, the project impact report is submitted for review / approval. Some changes will require additional supporting documentation to better describe / explain the change or impact of the change. For higher priority or high impact changes, it is generally best to provide a face to face explanation. The core team (or select members of the core team) approve all changes. This confirms that the core team agrees with the assessment, and the implementation approach for the change. The project sponsor or project steering committee approves changes that are over a specific impact threshold (e.g., two weeks, 40 hours, $2,500, new feature). The customer’s environment (compliance requirements) generally establishes the process associated with documentation of the approval (email, collaboration tool, verbal, signed copy of the PIR). The timing of the approval process is established to ensure that the impact does not become larger, due to delays in the approval process. Note: The review / approval process should occur BEFORE the actual change has occurred, and the corrective action has been implemented. This allows the reviewers/approvers to make decisions associated with changes to the project, and the change implementation approach. The same level of rigor is required to plan changes to the baseline plans, as were required to develop the baseline plan originally. This is an area that many teams fall short – they often behave like change is complete at the time it is approved (contrary to popular opinion, changes do not implement themselves). Project Schedule – Deliverables, activities, dependencies, and milestones are updated to reflect the impact of the change on the project schedule. In addition, the schedule baseline is adjusted (using “set baseline” in MS Project) to reflect the impact of the approved change on the project timeline. Risk Log – Risk ratings (probability and/or impact) are adjusted based upon approval and implementation of the change. In addition, the risk log is updated to reflect new risks introduced with implementation of the change. Verify that the action items identified to implement the change (documented on the project impact report) have been completed. Based upon implementation of the follow-up actions, re-assess the impact of the change and adjust the impact estimates (if required). Update the status of the change (on the change control summary log) to reflect that it has been fully implemented (and closed). Be proactive. The cost of implementing change increases later in the project/ product lifecycle. Utilize key metrics to monitor trends and identify potential changes. Project size (number activities, cost budget, number of resources), complexity (number and types of dependencies), and risk profile (number and distribution across project activities of high priority risks) are evaluated to adapt the change control processes to the project. If changes often have very different impacts (e.g. much higher cost or schedule impacts) when they are implemented, maybe there is not enough rigor involved with the change analysis process. Projects that place more importance on schedules and/ or cost constraints tend to require more control around analysis and approval processes. Provide visibility of the change request throughout the change control process to ensure that everyone involved with the project can easily find out the current status of any changes in the process, as well as the reasons for approving or rejecting specific changes. Ensuring that the change is implemented appropriately is critical because all of the effort that goes into analyzing and making decisions does not matter if the change is not actually implemented fully and correctly. There should be follow-up to confirm the implementation steps have been completed. One of my favorite questions when interviewing potential project management candidates is, “How do you manage change to your baseline plans.” First of all, many candidates fall into the trap of thinking baseline plans is the same thing as the schedule. Others think that change relates to customers adding features and functions to the product. The easiest way to describe change from a project perspective, is change represents anything that is a permanent (vs. timing) deviation from the original plans that define what is going to be delivered (scope), when it will be delivered (schedule), and how much it will cost (budget). Using collaboration tools, such as SharePoint, to manage change does not replace the diligence required to identify and manage project impacts effectively, but it does streamline the processes associated with documenting, reviewing and approving the change requests. In addition, SharePoint enhances the ability to effectively communicate project changes throughout the project life cycle. Id – System assigned unique identifier assigned for the change. Title – Headline associated with the change request (make sure it is descriptive enough to identify the item from the summary view of the change requests). Status – Drop down selection: Not Started, Documented, Reviewed, Approved, or Implemented. Cost Impact – Numeric field for the estimated impact the change request will have on the project budget. 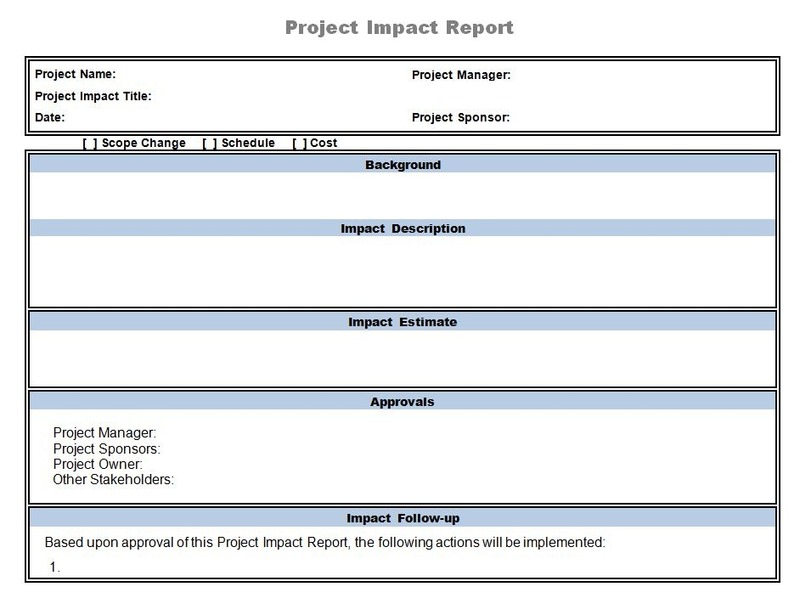 Schedule Impact – Numeric field for the estimated impact the change request will have on the project schedule. 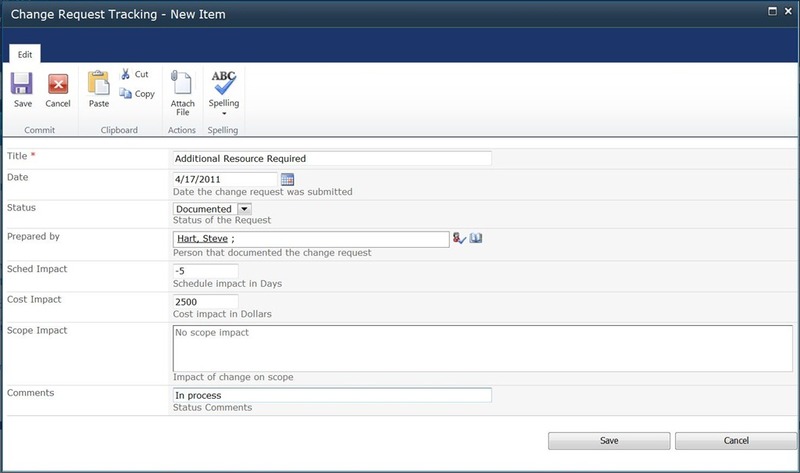 Scope Impact – Text field utilized to describe the impact the change request will have on the scope of the project. Comments – Text field utilized to describe the current status of the change request. Attachments – The change request should be supported with more details explaining the request and estimated impacts. A completed project impact document is attached to the change request item. 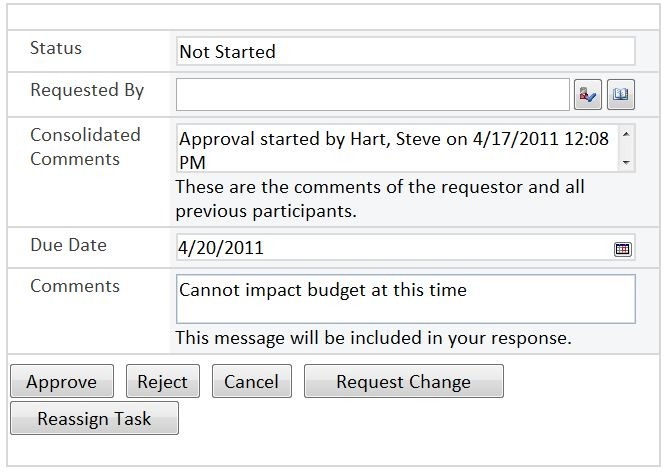 Below is an example of the Change Request form in SharePoint, and the Project Impact Report template. Creating workflow for this SharePoint list helps automate the approval and tracking process. At the time the item is added to the SharePoint list, an email is sent to the approver (see below for an example of the email). From this email, the approver can Approve, Request a Change, Reassign, or Reject the change request (see an example of the approval pop-up that is displayed within Outlook). Once the approver performs the approval process, the status of the workflow is updated within the SharePoint list (see the Change Request Workflow column of the All Items view below). I find it is best to keep the workflow straightforward, with no more than 2-3 approval levels. The benefits associated with approval automation can be lost in time spent on manual intervention if the workflow is too complicated. It is important to understand the cumulative impact of changes on a project with regards to the scope, schedule, and cost/ budget. Throughout the life of a project, there will be changes. The project core team, project sponsor, and steering committee members should be aware of the cumulative impact of changes (comparing current project performance to the original expectations established in the baseline plan). The project manager is ultimately responsible for project execution against the baseline. The project manager should be able to explain the evolution of that plan from the original baseline to the current baseline, including all approved changes that have been implemented. Project managers often will fall back on the excuse that the project is over budget or late because there were constant changes, but often cannot quickly explain the changes that account for the primary deviations from the original plan. Effective use of the Change Request Log provides a tool to track and reconcile changes to the baseline plan (and provide as a regular project performance metric). I create another view within the Change Request list to communicate the cumulative impact of change on the project. This new view filters for only approved or implemented requests, provides a total count of approved/implemented requests, and sums the total schedule and cost impacts. Below is an example of the approved requests view of the change requests. SharePoint provides a great vehicle to capture and track change requests in a timely and accurate manner. In addition, adding workflow to the SharePoint list automates the change review and approval processes. The information captured within this list allows the project manager to communicate effectively around the team’s ability to manage change and accurately describe the cumulative impact of this change on the project.